EURUSD remains in the uptrend from 1.1183, the pullback from 1.1323 is likely consolidation for the uptrend. As long as the price is above the rising trend line on the 4-hour chart, the upside movement could be expected to resume and further rise towards 1.1350 area is still possible after the consolidation. 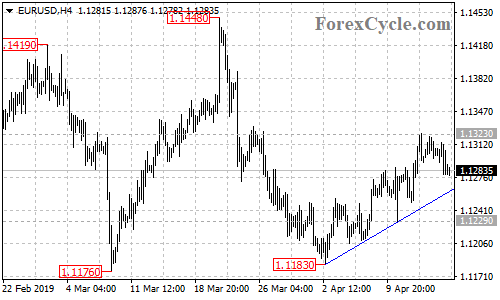 Only a breakdown below the trend line support would suggest that the upside movement had completed at 1.1323 already, then another fall towards 1.1100 could be seen.